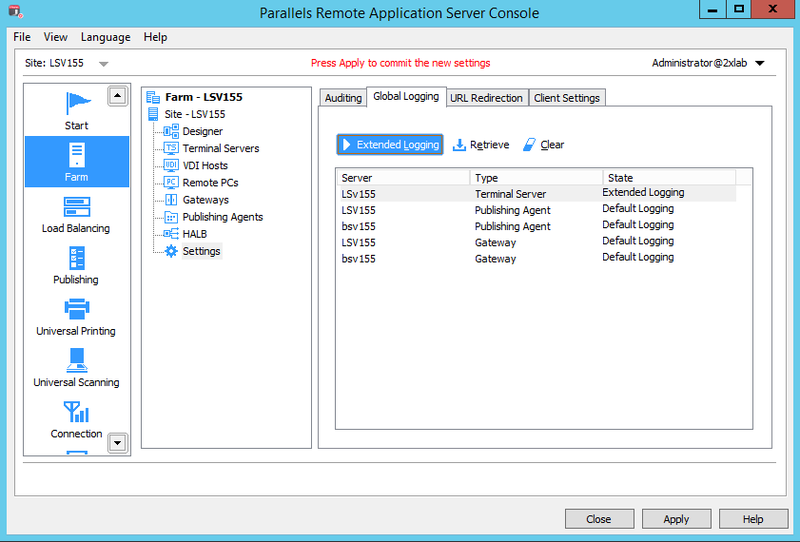 In Parallels Remote Application Server version 15.5 and higher logs are enabled by default in Standard mode. 2 levels of logging are available Standard and Extended. In the RAS Console, navigate to Farm / / Terminal Servers. Global logging is enabled by default. You can choose whether to use the default (standard) or extended logging. 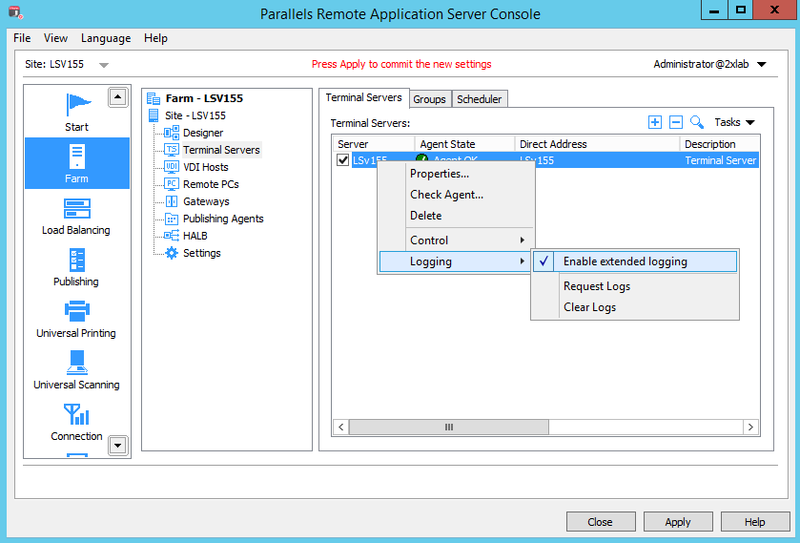 To enable extended logging for a server, right-click the server and choose Logging > Enable extended logging. If you open the menu again, a check mark is displayed in front of the Enable extended logging item to indicate that it is turned on. To disable extended logging, click Logging > Enable extended logging again. If you open the menu now, the check park should no longer appear. To view the log file for a server, right-click the server and choose Logging > Request Logs. To clear a server log file, right-click the server and then choose Logging > Clear Log File. You can also enable, disable, and manage logging globally for all servers on a given site. When reporting a problem to Parallels Support it is useful to prepare the log file which can be sent with the support request. To prepare the log file follow the below procedure. In the RAS Console, navigate to Farm / / Settings and click the Global Logging tab. Type - server type (e.g. Terminal Server, Publishing Agent, Gateway). State - logging state (level). Can be one of the following: Default and Extended. Extended logs contain more data, but take more disk space. To set a logging level, select a server in the list and click the Extended Logging action item. The State column will show which level is set. Click the Extended Logging item again to change the logging level. The Retrieve action item retrieves all logs and saves them to a file (you'll need to specify a file name and location). The Clear action item clears all logs. Note that once you click this item, the logs will be cleared with no additional warning.